Report on Your LotR projects. Subject: Re:Report on Your LotR projects. My Grey Company army is now finished! Three Hunters, Elladan and Elrohir, Halbarad with Evenstar Banner and 10 Rangers with Spears. Bang on 1000pts. Should make a fun (though totally bonkers) low mini count match for my Dol Guldur force! Subject: Report on Your LotR projects. Nice, that's a really cool army! Mounted Theoden from Pelennor. Love this model, such a great example of what the plastics can do. Really looking forward to picking up the new Three Hunters and Eowyn if they're this good. Great looking mini, well executed! Paradigm, that is a professional job. Cheers guys, I'm really pleased with how he came out. It was a delightful model to work on though, so crisp. Normally, I find larger minis (and especially cavalry, with so many extra textures and surfaces going on) a bit daunting, but painting this one was a pleasure from beginning to end. In classic Eldarain fashion I had 2 models painted last Monday and my first tournament on Saturday morning. Super happy I was able to power through and get fully painted in time and even got some best army votes! Gandalf and Pippin on the walls of Minas Tirith. 'Guard of the Citadel indeed'. When I realised how well these minis filled a shared base, I had to capture that scene. It's my first conversion but i think this Thorin models lends itself quite well to being mounted. Ive still got some work to do but if anyone has any suggestions hen please let me know! Some excellent green stuff work there on that Thorin, Bacon Man! Love it. So I decided to jump feet first into the game. Picked up the Pelennor Fields box to start Mordor, and selling the Good side to a fellow player. I also ordered the Morannon Command, the Gothmog pack, the Gorbag and Shagrat pack, and two packs of Orc Trackers. I also got a box of Mordor Orcs (which a local store has on the self for 20% off, and it's the old 24 man version. 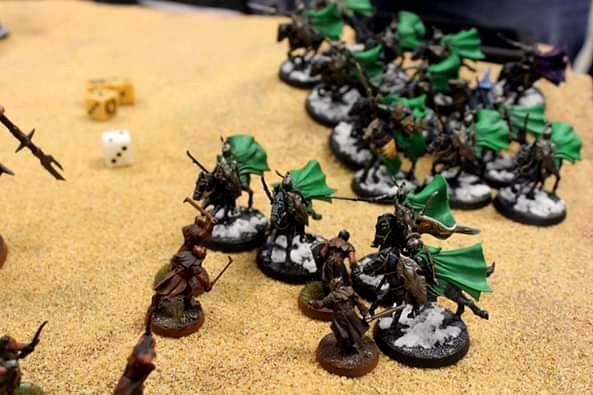 I may go back and grab their Warriors of Minis Tirith box as well...), which I'd like to use to convert a group of Warg Riders into all having swords. Gil-Galad (foot, mounted), Armoured Glorfindel (foot and mounted), Unarmoured Glorfindel (foot and mounted), Elrond (foot and mounted), Armoured Elladan and Elrohir (foot and mounted), Erestor, Lindir (unarmoured, on foot), Cirdan, Gildor and Arwen (foot and mounted), High Elf Captain, Banner, 6 Rivendell Knights, 12 Warriors with Shield, 12 Warriors with Spear and Shield, 12 Warriors with Bow and Spear and 8 Warriors with Elven Blades. At this point, I'm just about fully complete, and I don't see myself expanding for a short while. 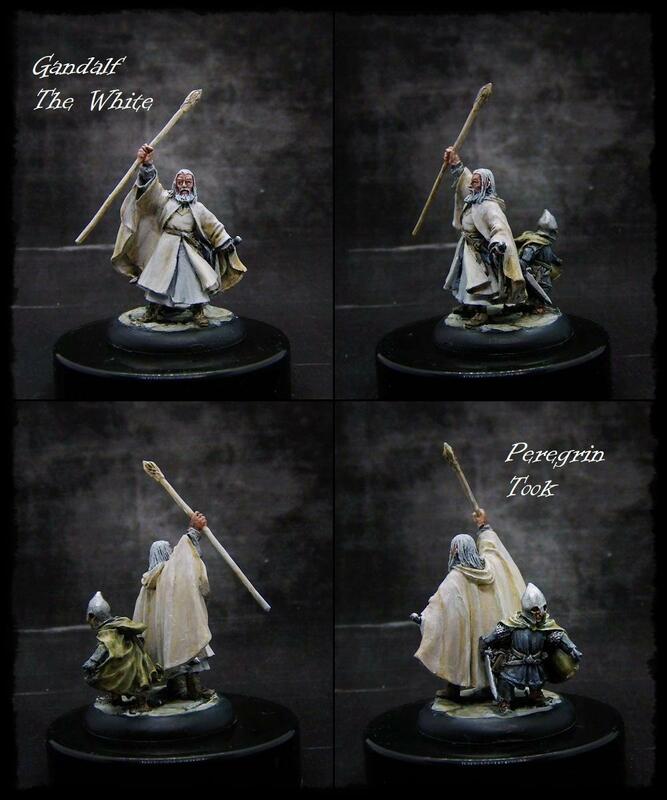 I'd quite like to convert an armoured/mounted Lindir sometime, I'd like to do a warband of 12 Exiles to hang out with Gildor and I'd quite like to do some proper dismount minis for my Rivendell Knights with black cloaks, but that's about it. I also expanded out my mini collection of Moria goblins into a fully fledged army, adding more Archers, a Command set, the Goblin King of Moria, a couple Giant Bat swarms and, of course, the Balrog. I'm realising now that it's been a while since I posted a proper update here. Going at a much slower pace than my previous armies, I've also started work on a small Iron Hills project, which I'd rather like to get together for an event come September (or much earlier), but seeing as it's largely a passion project that is very much surplus to requirements at this point, I'm trying to take my time with it and not get too burnt out. Anyway, I have Dáin (foot and mounted) plus six Spearmen done at this stage. Inspiring as always fellows. As always my hobby time is scattered across multiple systems but focusing on an alternative Return of the King scheme next. Oh boy Haanz!! Superb armies! I am just starting with Middle-Earth and I am thinking of a dwarf and some Evil army. Finished my first batch of Iron Hills. 12 Warriors and Dáin! Painting those 12 Iron Hills Warriors was a lot more taxing than I expected it to be though. As a change of pace and a palette cleanser, I decided to paint the missing minis I needed to make a full (cinematic version) White Council. 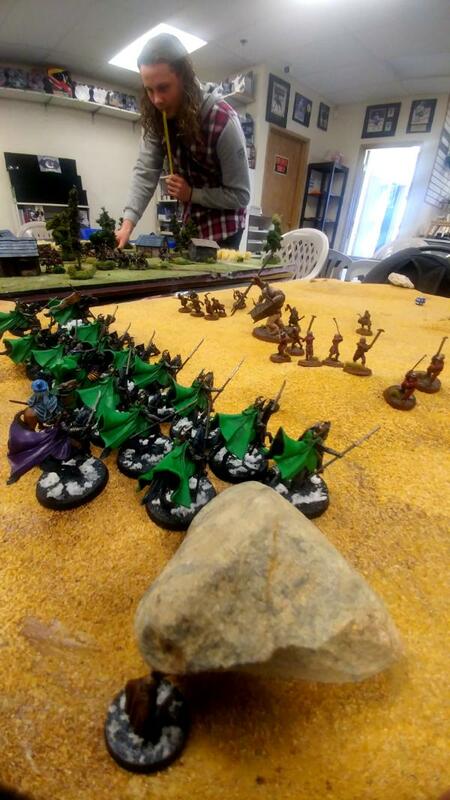 Just a shame my Saruman has my 'Evil army' basing scheme. I do have a 'White Council' version of him that I could paint, but I don't think he's as good as the original sculpt. I would like to paint my Elrond from the foot and mounted kit to replace my Last Alliance one though, and it annoys me that I now have two Gandalf the Grey (this one, and the Khazad Dúm one) minis and neither have his hat. Ah well. 9 Mounted Ringwraiths for a narrative campaign are next! Just finished a Dwalin conversion up. I didnt know how it really would turn out but i like the pose as it seems like he's on the back swing after slapping an orc! I used quite a few different bits from the goat rider kits and Dwalin champion of erebor kit. All done with my Mordor army, for the moment! I'm thinking of putting together a Morgul Knight box, and I've been considering leaders. I think I'm going to go with a generic Ringwraith, if I can find a foot and mounted version. Also, Unreleased Miniatures just came out with some really cool looking Black Hearted Men which are obviously dismounted Morgul Knights.